Love the input CC has. Also like when you have coach on. Canât watch anymore tho cause Nick is such a hater and LeBron fanatic. This show has really grown in me. Nick is very knowledgeable and great to listen too. CC has always been one of my favorites. Insightful and very funny. Well done. Canât download any episodes right now. What seems to be the problem!? Couldnât download the last couple of podcasts. Also, they have been coming in a couple days after the episode actually aired. Keep doing your thing. Love the basketball and football analysis and unique takes that never feel forced just to get a reaction. Love sports but hate the dumb personalities that cover them. This feels the most like real people talking.But why does it take so long to post these sometimes? Sometimes not even posted at all. Why? I used to be an avid first take and skip and Shannon listener but both shows have taken a major step back. First take all they do is yell and disagree with each other. Then you have molly chiming in with irrelevant and just down right stupid opinions that donât add anything to the show. Skip and Shannon do the same thing as first take except the devote at least 30 minutes every show talking about the cowboys. BUT First things First is different, they have very informed opinions and everyone adds a unique quality to the show. The mediator actually does a great job and then adds good input on a lot of the subjects. Nick wright is different which makes him great, and Chris Carter knows what the hell he is talking about. LOVE THE SHOW! Please donât let Broussard talk football. Itâs not basketball. This is the first review Iâve ever done. Nick Wright is great on NBA and Cris Carter has real insight when it comes to the NFL. Needs more Chris Canty. One of my favorite sports podcasts! Cris and Nick are a great combination! I listen to multiple sports podcasts, so it is disappointing that the tech guys upload these episodes so late in the day. Especially compared to other early morning podcasts. If this was improved it would be a 5 star rating! But my only complaint is the times they give for each segment are regularly incorrect. Thereâs times when a certain segment is 30 minutes past the time itâs states. Other than that, Nick Wright is awesome and argues logically. Chris Carter does as well and brings unique insights to football that you donât hear anywhere else. Love the cast on this show. 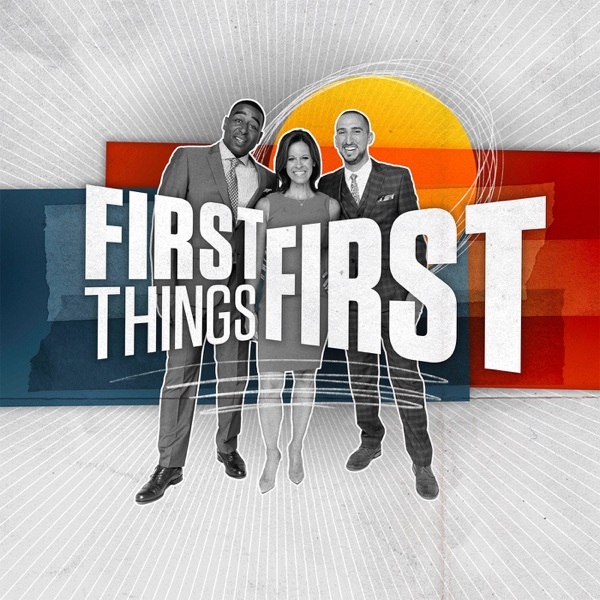 Chris Carter, Nick Wright & Jenna Wolfe. Canât forget about Chris Canty & Eric Mangini. They always have great topics to discuss. By far my favorite sports podcast. All three hosts are amazing and the guests are hilarious. Would give five stars, but itâs so upsetting I have to basically wait till the next day to listen. Also call out Skip. Heâs a shock jock who ruins the integrity of yâalls profession. If I see someone at work doing something wrong I tell them, itâs called being professional. Yâall canât criticize the fraternity style of players and coaches while letting one of your own discredit the hard work yâall do. Shame I canât give yâall 5 stars. Love C.C. Also nick carter is cool. Good to see a good dude like nick come up. I love Nick! Youâre the man! CC is aight, HOFer. Iâd stop doing the same set twice for *full episodes*, mostly saving the worst part of your podcast. But , and Iâm guessing here in spelling, Jenna.. She is great and very tolerant of you guys machismo. So... Like... I mean ( Wright begins every statement with those words) CC gives /cred/ to analysis and is funny. I enjoy him and am so happy he got a show and is no longer a feature on others. However, Nick spends most of each show kissing up to him while trying to be cool. He often is wrong and has to be corrected by CC on many things. Mr Wright also brings in is racial views and believes because he is in an IR relationship he has /cred/ to those topics. I come from a IR, and my father acts nothing like Mr Wright. I take that back, his jokes are not funny either. Wish CC had a different co-host and I love when Wright is wrong then called out by CC.. Mrs. Wolf adds a little excitment early in the day as well. Thanks Mr. Carter! Always loved nick on the herd. Glad they gave him a show. now letâs change the fs1 morning line up. First things first, the odd couple then the herd. Great show. It would be great if the podcast got a little more juice by including what the TV show doesnât, let us hear whatâs happening during the breaks. Too bad nobodyâs going to read this. The show is amazing and I love the Nick and Chris combo. But they canât take 5 hours to release he show on podcast if they want me to listen everyday. For example, The Herd ends at 3 eastern time, and the podcast is always up before 4. This show finishes at 9:30 Eastern and isnât released on podcast till after 12 or 1. FS1 has to many good podcasts and new info is always coming up, so Iâm going to listen to the most recent released show if i have to wait till 2 to listen. I enjoy the show, but all they discuss is football and Lebron James. Give me some baseball!!!!!!! Iâm an everyday listener and watch whenever Iâm up early enough. These guys know their stuff and are honest on their takes. Please his takes mean absolutely nothing to me canât listen/watch the show anymore because of him! Great job casting this attention hound! Theyâre Americaâs biggest bullies in the sports world. Gosh they compete too hard and repeat horrible sport topics and are not original. This sure beats the laughfest that is Golic and Wingo. Keep it real boys! And maâam! Listening to this shows podcast on 1/2 speed is the funniest thing. Everyone sounds drunk!!! Whether or not you agree with their takes or sports knowledge or their views in general, the best thing about this show is the undeniable and real chemistry between the players. You can feel from when people get fed up with Nickâs big words, to when CC wonât let anyone else talk, to my favorite when they give Jenna crap for her awkwardness. It is rare to hear silence coming back from breaks because they are always laughing and guests say the breaks could be a show all their own. When I listen to this it feels like three good friends talking about sports. In a business where everyone is trying to force chemistry this comes very naturally and is blast to listen too! And of course fantastic sports knowledge all around! While I do enjoy Nick Wright even if his Lebron infatuation is sometimes a bit obnoxious, Cris Carter is the worst. Did you know that Carter taught every athlete of every sport what they know? He taught Brady how to throw a football, Jordan how to shoot, Tiger how to putt, Beckham how to kick, and he also helped Babe Ruth improve his swing. The most self-important douche I have ever heard speak. He isnât even the best receiver in his own teams history (Vikings)! It is amazing that somehow athletes were successful before his personal tutelage. Hopefully Fox dumbs that blowhard and hire someone how actually really has some takes and opinions other than Cris Carterâs fake know-it-all, never wrong comments. DO BETTER FOX. P.s. the only thing worse that Cris Carter is Ray Lewis so please donât put him on television ever. Thanks. No Screaming A. Smith!!!!!!!! !Finally a debate show I can listen to without busting an eardrum. Great show with respectful disagreements that actually make sense. Where should I complain first. Whoever writes the script for Jenna is very corny with corny punchlines she's not a very good mediator because she knows nothing about sports and Nic young needs to go back to journalism because none of his responses make sense and he looks like a little 12 year old that hasn't hit puberty yet. No wonder these guys come on early in the morning because nobody wants to see this crap! Solid when they talk about sports. I really liked these guys when they first started their show and Iâm more or less a daily listener. When they talk about sports, they have good insight but it always feels like theyâre pandering/condescending when they try to talk politics. They also have a relatively small stable of regular guests, which I guess is normal for a new show, but they have good rapport. I just think they need to streamline and focus, and not be so holier than thou to take it to the next level. Hi absolutely love the show but why does it take so long sometimes to get it uploaded. I always enjoy listening to Nick talk about sport, can listen to him all day long, Very knowledgeable, keep up the good work. I listen to FTF everyday at work. The banter and views from Nick, CC and Jenna keep me interested from start to finish. Fantastic entertainment and intriguing takes with the facts and stats to back them up. Guests have a wide range from one time appearances to frequent guests, like Chris Broussard. Love it. Nick is quickly becoming one of my favorite personalities in national sports media. Does a great job with facts and statistics to hammer home his points. Iâve been following nick wright since he moved from KC to be the morning host in houston. From the start I knew he wasnât going to last long because he was so good. I loved him so much I even made his first Wikipedia page. Love to see him keep moving up and doing great things. Can one of you educated folks on the show please tell Chris Carter âconversateâ is not a word? Embarrassing that someone who uses âconversateâ shares a show with media people who are actually qualified. Thank you for putting the full show on the podcast for this and undisputed. I am thankful! Please make tha podcast longer. Love tha show!!!! Great show. Make podcast longer. Love the show, daily listener. Great team but special shout out to Nick Wright who I grew up listening to in KC and have followed since... knew your insight and passion was to good to be contained, keep at it.